We have a specially formulated "Garden Mix" blended for optimum composting results. It's the BEST of all worlds for composting. By using this mix of worms you will have a combination that will aerate your soil at three levels since they all feed and breed at different depths; thus giving your soil a natural rototilling. The Africans feed on top,Eisenias feed in the middle and the Hybrid Red Wigglers burrrow deep. Worms enhance your plants' ability to breath and spread it's roots and therefore, better absorb nutrients from the soil. As with the individual species, DO NOT REFERIGATE these worms! 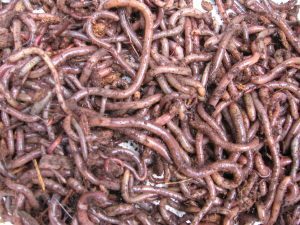 Nothing out eats this combination of HUNGRY WORMS!